Over the years, the residents of 1600 Pennsylvania Avenue haven't been that much different from you or me. They eat dinner at home. They laugh and argue. They talk about redecorating — and whether that's really white (or one of the 15 variations of "eggshell"), and they share their lives with cats, dogs, guinea pigs and all sorts of household pets. Of all the presidential pets throughout all the presidential administrations — ever since John Adams, the second U.S. president, first pulled his horse-drawn U-Haul up to the newly built palace in 1800 — alligators might be the strangest. And that's saying something. It's true, though. Or true-ish. According to the Presidential Pet Museum, the story goes that John Quincy Adams (John Adams' son and the sixth U.S. president, from 1825-1829) housed an alligator in the unfinished East Room of the President's House. (President Theodore Roosevelt officially gave the White House its current name in 1901.) The alligator — whose name seems to be have been lost to time — was a gift from the French military officer Marquis de Lafayette, who fought with the U.S. against the British in the American Revolution and was an old Adams' family friend. Old JQA kept his gator in a bathtub — so the story goes — and enjoyed scaring guests by springing the big fella on them. "If he had a very large alligator in a bathtub in today's world," says Frank Mazzotti, an ecologist and biologist at the University of Florida, "they'd be after his fanny for cruel treatment." Whatever the case, the alligator allegedly lived for some time in the presidential digs, where he ostensibly grew both in stature and as a bit of Washington lore. The whole idea of a reptile in the people's house would have been unique, too. But then, a century later, Allan Henry Hoover, son of Herbert Hoover (No. 31, from 1929-1933) and his two gators showed up. Allegedly, that is. Those gators supposedly were allowed to roam the White House grounds which, as the folks at the Presidential Pet Museum also point out, probably kept King Tut on his toes. King Tut was President Hoover's German shepherd. Those two gators — names also unknown — were the last known caimans to reside (allegedly) in the White House. And that's a good thing, probably, considering the work that goes into keeping one as a pet. "The big question I have for people is, 'Are you sure you know what you're getting into?'" says Mazzotti who, considering he's from the University of Florida, we must note is a Gator himself. "Do you want to have something as a pet that might start out small and manageable but can grow to be 10-feet long, weigh over 200 pounds and s**** and stinks like a horse? Most people are really not prepared for that." Well, Adams and the Hoover boy didn't mind, evidently. If those stories are to be believed. And some people still are not buying it. "The thing with that whole story, especially with Lafayette, is it's often repeated, but we really haven't found the origin of the story, or any kind of primary documentation that really has a basis in reality," says Evan Phifer, a historian with The White House Historical Association. "There's no verifiable documentary evidence of that story," says Joel Treese, another WHHA historian. "I think it's probably a legend." Even if the alligators in the White House tales are to be discounted, the presidential digs still have housed more than a few nontraditional pets through the years. A couple of bear cubs: Thomas Jefferson (No. 3, 1801-1809) received a pair of grizzly bear cubs as a gift from an explorer of the American West, according to the Thomas Jefferson Foundation. They were an instant hit. "This was really interesting for people who would come to visit, because they could see these animals that, really, Americans hadn't seen before." Phifer says. The bears lived in an enclosure on the lawn of the "President's House" before being moved to Philadelphia. A raccoon: Grace Coolidge, wife of Calvin (No. 30, 1923-1929), kept a raccoon named Rebecca at the White House. "[Rebecca] originally, actually, was going to end up on the White House table for Thanksgiving, but they fell in love with the raccoon, and she was a feature at the White House for quite a bit. They even had a little cage for her outside, and a gold-plated inscribed collar as well," Phifer says. "Rebecca the raccoon became very much a Coolidge family pet," Treese adds. A badger: Theodore Roosevelt (No. 26, 1901-1909) had a zoo's worth of animals. The most famous, perhaps, was Josiah, a badger, who often was carried around the White House grounds by young Archie Roosevelt. A flock of sheep: Woodrow Wilson (No. 28, 1913-1921) let as many as 48 of them graze on the South Lawn as a show of support for the troops during World War I. The sheep were shorn, and their wool sold for wartime causes. Horses of all sorts: The White House at one time had a stable big enough for 25 horses and a living area for coachmen and stable hands. The stables caught fire in 1864 — President Abraham Lincoln tried to help put out the fire — and finally were dismantled in the early 1900s. Zachary Taylor (No. 12, 1849-50) was among many presidents who took a warhorse — his was named "Old Whitey" — with him to the President's House. Another famous equine to spend time at the White House was Macaroni. Caroline Kennedy, the daughter of John F. Kennedy (No. 35, 1961-1963), was often photographed on the pony, who was kept on a nearby farm, not at 1600 Penn. Opossums: The story goes that Benjamin Harrison (No. 23, 1889-1893) had two pet opossums at the White House. It's difficult to confirm, as is the answer to why the two marsupials allegedly were named Mr. Reciprocity and Mr. Protection. However, President Hoover did preside over a ceremony on White House grounds involving an opossum and a local high school sports team, Phifer says. Snakes, hens, a one-legged rooster, a hyena, a small bear named Jonathan Edwards ... All from Roosevelt's menagerie, according to the National Park Service. Despite the bizarreness of some of these choices, the pet most recognized as a presidential sidekick — at least for modern-day presidents — is the loyal canine. The most famous, probably, was Fala, who was so close to Franklin Delano Roosevelt (No. 32, 1933-1945) that the little Scottish terrier attended his funeral and is forever memorialized at the FDR museum in Washington. Many others qualified as a president's Best Friend: Warren G. Harding (No. 29, 1921-1923) gave his dog, Laddie Boy, a hand-carved chair to sit in during meetings. Lyndon Johnson (No. 36, 1963-1969) sung with Yuki in the Oval Office. Liberty hung out with Gerald Ford (No. 38, 1974-1977), Lucky with Ronald Reagan (No. 40, 1981-1989), and Millie with George H.W. Bush (No. 41, 1989-1993). Bo and Sunny, a pair of Portuguese water dogs, keep Barack Obama (No. 44, 2009-present) and his family company. 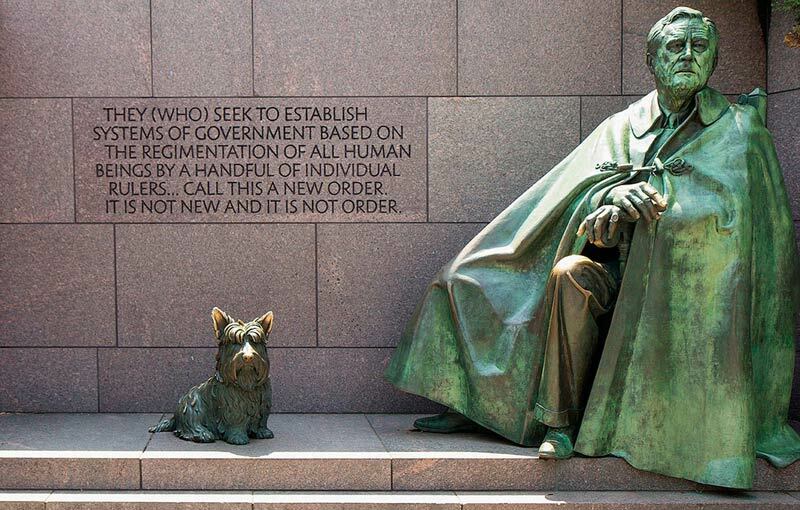 "Pets humanize the White House and the presidency. Just like so many Americans have pets, so do the presidents," Phifer says. "It's a link between the life of a president and the lives of millions of Americans." Then GOP vice presidential candidate Sen. Richard Nixon photographed with his beloved cocker spaniel Checkers on Sept. 29, 1952. 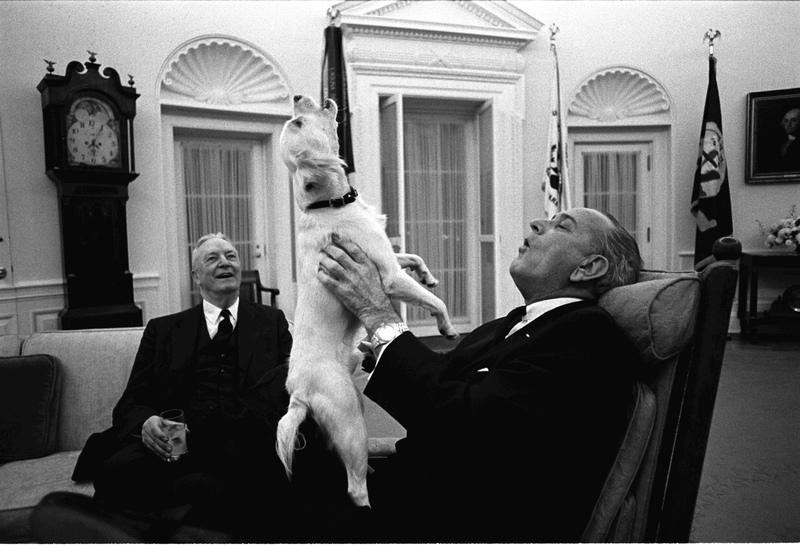 One of the most famous of presidential pooches was Checkers, Richard Nixon's dog. Checkers was mentioned in a 1952 Nixon speech that later became known as the "Checkers Speech," which was credited with helping save Nixon's political career. 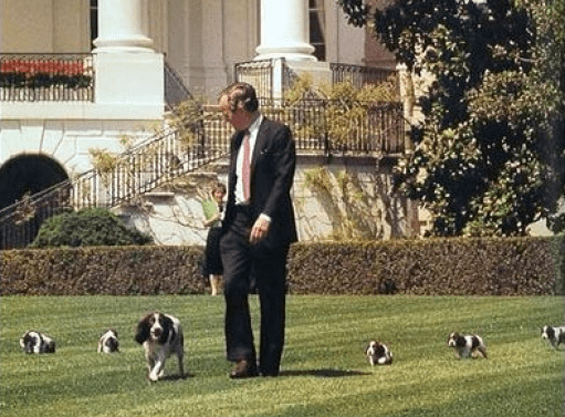 Ironically, Checkers, a black-and-white cocker spaniel, never made it to the White House. 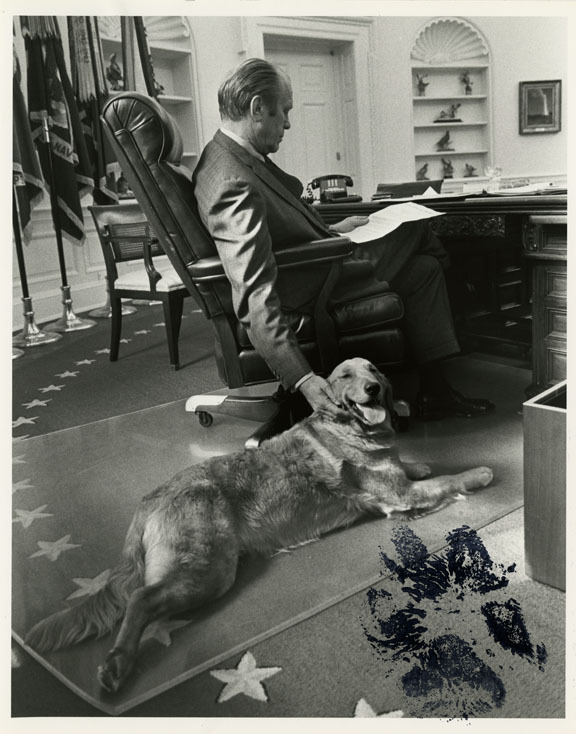 The dog died before Nixon took office in 1969. Thought Experiment: What's Our Transhuman Path Beyond Earth? The Ultimate Social Network Is … the White House?